Worse than Kakarot and Raditz here? This broke my heart into a million pieces. Heck he barely cares about his own family, he just treats them as friends. 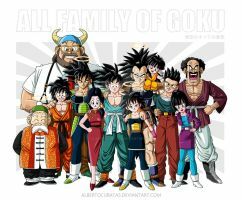 I really hope someday Goku gets to meet his parents, they'd be proud to know he's accomplished so much. Outstanding work CFFC. It's Over 9000! Why would Gine b in hell? Also she's a saiyan, i doubt she normally is good, but who knows? I knew i was right when i made that Goku's mother didn't die in "everyone's fanfic"